Japan is not releasing any important economic reports however, the US is publishing Richmond Manufacturing Index and HPI m/m. The support rests at 109.100 with resistance at 109.550 which both lines are below the monthly pivot point at 111.650. 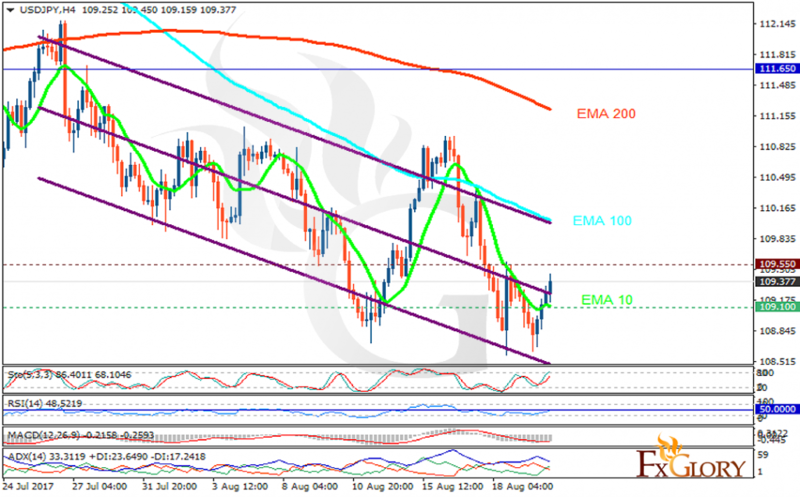 The EMA of 10 is moving with bearish bias along the descendant channel and it is below the EMA of 100 and the EMA of 200. The RSI is rising towards the 50 level, the Stochastic is showing upward momentum and the MACD indicator is in negative territory. The ADX is showing buy signals. USDJPY is growing towards 110 area; however, in case of price decline, sellers can target 108.5.